A chiropractor in Ottawa is hoping to strike a blow against the after-effects of concussions, using a treatment that helped get the NHL's biggest superstar back in the game. Dr. Joseph Lawrence says he's adopted a cutting-edge diagnosis and treatment technique from a doctor in Atlanta, who helped Pittsburgh Penguins star Sidney Crosby recover from a series of significant concussions in 2012. The treatment uses three camera diagnostic tools to track eye movement, to determine which areas of the brain have been affected by concussions. Lawrence says the eye-tracking technique allows him to identify and compensate for a concussion's impact on the brain. 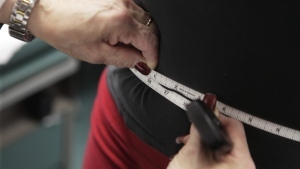 "We just really stimulate that process to sort of rewire the brain, if you will, so the individual can get back to their activities of daily living," he told CTV Ottawa on Wednesday. 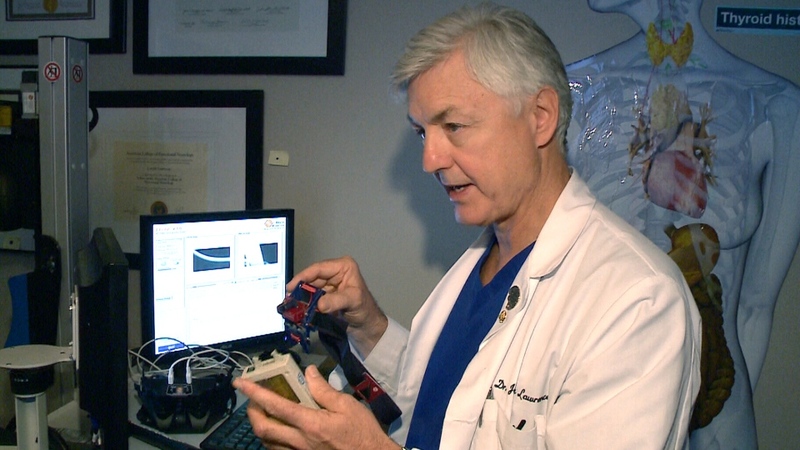 The procedure is the brainchild of Dr. Ted Carrick, a Canadian-born, U.S.-based specialist in chiropractic neurology. Carrick has treated several NHLers for post-concussion symptoms, including Sydney Crosby, who suffered a devastating series of concussions during the 2010-11 NHL season. Crosby sustained two significant blows to the head in January 2011 -- first in an outdoor game against the Washington Capitals, then in a game against the Tampa Bay Lightning a few days later. He played his last game of the season on Jan. 5, 2011, and did not return until November of the next season. Crosby was in and out of the Penguins' lineup that season as he struggled to overcome the linger effects of his concussions, which limited him to just 28 of a possible 88 games. However, after visiting Carrick in early 2012, Crosby managed to return to the lineup and lead the Penguins into the playoffs in March and April. Crosby has credited Carrick's treatment with helping him return to the game. "I'm probably more confident than ever that they'll eventually find ways to help," Crosby said of the concussion treatment. Professional athletes like Crosby lend a public face to the dangers of concussions. But an estimated 94,000 Canadians sustain concussions every year, often while playing sports. About one-third of those concussions affect teens like Taylor MacLeod, an Ottawa girl who hopes she can get some relief from her symptoms with Lawrence's treatment. "I'm very excited that it's here in Ottawa now, because then it can open up other opportunities," MacLeod, 15, told CTV Ottawa. Post-concussion symptoms can leave the affected person feeling dizzy, confused, light-headed and unable to tolerate loud noises or bright lights. Some sufferers also experience balance problems, changes to their sleeping patterns, distortion in their vision and mood swings. MacLeod says she's had to scale back her athletic activities due to a series of concussions she's sustained over the last five years, all suffered while playing sports. Taylor's father, Ian, says nothing else has helped with her recovery. "There hasn't really been anything so far, other than time, that's shown any improvement," he said. But with the new concussion treatment, Ian says he hopes "something can be done" to make life "a little more normal" for his daughter. Dr. Joseph Lawrence, a chiropractor at the Broadview Spine & Health Centre, shows off his concussion treatment tool in Ottawa on Oct. 7, 2015. Pittsburgh Penguins captain Sidney Crosby speaks about his recovery from concussions. 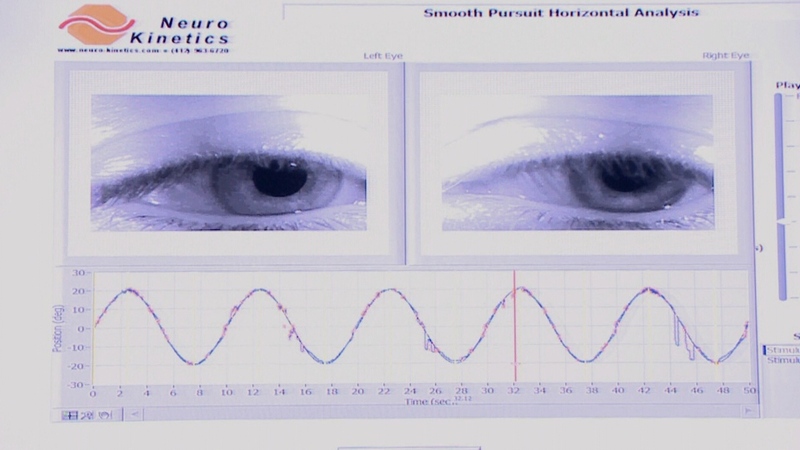 A concussion diagnostic tool monitors a patient's eye movements.